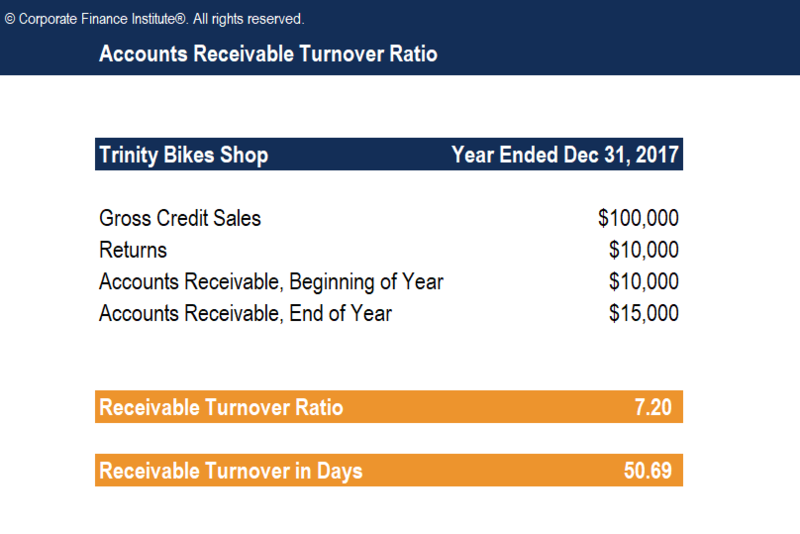 This Accounts Receivable Turnover Ratio Template will show you how to calculate receivable turnover ratio and receivable turnover in days. The accounts receivable turnover ratio, also known as the debtor’s turnover ratio, is an efficiency ratioFinancial RatiosFinancial ratios are created with the use of numerical values taken from financial statements to gain meaningful information about a company. The numbers found on a company’s financial statements – balance sheet, income statement, and cash flow statement are used to perform quantitative analysis and assess a company's liquidity, leverage, growth that measures how efficiently a company is using its assets. The accounts receivable turnover ratio measures the number of times over a given period that a company collects its average accounts receivableAccounts ReceivableAccounts Receivable (AR) represents the credit sales of a business, which are not yet fully paid by its customers, a current asset on the balance sheet. Companies allow their clients to pay at a reasonable, extended period of time, provided that the terms are agreed upon..
Net credit salesCredit SalesCredit sales refer to a sale in which the amount owed will be paid at a later date. Credit sales are purchases made by customers who do pay cash at the time of purhcase.There are three main types of sales transaction: cash sales, credit sales, and advance payment sales. The difference between these are sales where the cash is collected at a later date. The formula for net credit sales is = Sales on credit – Sales returns – Sales allowances. Average accounts receivable is the sum of starting and ending accounts receivable over a time period (such as monthly or quarterly), divided by 2.